I discovered his list of four videos: 1. Denzel tells the boy visiting him in jail that writing is his “sword”, more than fists, he uses it to change his world! 2. A blind man’s sign is changed to use more precise words which causes those around him to act differently – so moving!! 3. Famous people share how they use writing in their lives. 4. Regular people share how they use writing in their lives. I plan to use these videos he found to motivate my students in Writing Workshop when school starts in September!! I am so glad I follow twitter and can connect with such smart educators like Larry! I very likely will never meet Larry but thanks to twitter posts and blog posts, he is now a go-to resource for me as a teacher! Book Clubs – Mary E.
Her opinion is that Kylene’s technique is a starting point for teaching students how to make annotated notes. She pointed out that a plus is it keeps the student in the text. However, it does not encourage them to respond to why the author had a character act this way, the craft. To help with craft, Mary gave us a handout of fiction techniques and goals that the technique lead. In our clubs, we continued to use these strategies to talk about our book club fiction novel. I do see these being strategies I could use definitely with UVW readers and maybe RST, too. Mary finished our week together by suggesting 3 ways I could return to my school and share my learning. * Study Group – teachers choose to join and come together to discuss a topic, return to classroom to try things related to a topic, and return to discuss some more. They may decide to read a text together. * Workshop – I would ask teacher to come learn about a topic that I am knowledgeable about and provide time to for me to teach and time for teachers to practice the task themselves. * Think Tank – a group of teachers who come together wondering about how something will work. They agree to try things out, do research, and meet together to figure out more about the topic. With all of these ways, Mary emphasized the importance of having the teachers try the work themselves. She used the sports analogy – if you are wanting to get better at running, you do not just sit around the table and talk about running – YOU RUN! NF Read-Alouds –Kathleen showed us a vimeo video of her reading aloud Seymore Simon’s Gorilla. Each partnership had a word bank and a map of Africa to refer to during the read-aloud. What stood out was the engagement of the class as they used the materials during the turn and talk time of the read-aloud. She also guided them through her questioning and think aloud to the bigger question of adaptation. She pointed out that this is a very easy structure to use – 1 book and a ½ class set of materials. I know for a fact that I haven’t spent much time doing NF Read-Alouds. I always for fiction read-alouds. I vow to change this habit! Kathleen showed us the Paul Reeve’s engraving of the Boston Massacre. Then another image of this event and a third image. In small groups we discussed how they were different and why they were different. Our inquiry led to the idea of bias by the person making the image, the idea of propaganda. She also shared a Cobblestone article related to the Paul Reeve engraving. Then we had a whole class discussion using the images and article as evidence of our thinking. Finally Kathleen shared the idea of Storytelling. She placed a page of 6 images on the screen and began to tell the story of Paul Reeve’s ride. She pointed out that after she did this, kids began to find more information to add to the storyboard to revise the story. A colleague shared www.tellagami.com as a possible online storyboard. She ended by sharing a 6th grader’s documentary on the Depression. Very impressive work! The theme was music! Piano playing greeted us as we entered the Cowin Center. Then Ryan’s group came on stage and sang 3 popular songs where they changed the words to celebrate reading. Cause I am a reader and you’re gonna see me soar. How you gonna read so smooth? Don’t you know I’m fluent too? Then 2 beautiful voices sang For Good from Wicked. We paused to remember the passing of Walter Deam Myers as Audra read Harlem. Finally Kathy Collin’s humor had us laughing and ready to head home, grateful for the week together. Grateful to be a teacher of reading! Book Clubs with Mary E.
What a great 30 minute discussion our club had with another book club today!! First Mary had us plan out a 10 minute presentation by prompting us to think about what we want the other club to know and feel about our rainforest topic and decide what we can show them as well as tell them? Our 4 members decided what we would each share. I was taken by the sentence in the book that said, “Tropical scientist believe that, at the present rate of destruction, there will be no rainforests left by the year 2050.” I shared this fact and pointed out how this is just 37 years from now. I stressed how I plan to still be alive in 37 more years and I want to live in a world WITH rainforests. After our 10 minute presentation, the other group shared. They had read the same book but interestingly enough, their presentation had no overlap with ours. Instead, they noticed the strong structure of the book Even though I had been reading this book for 3 days, I learned so much more listening to their 10 minute presentation. Then for the last 10 minutes, Mary had given us another text, Causes of Climate Change by Peter Benoit. Now we were to discuss any connections we saw between this new text and the book we had been studying. Again, such rich discussion based on our reading. My big take away from being in a NF book club was how my reading and thinking about a nonfiction topic pushed us all to think more about the actions we can take so we can live better. I love that I did so much more than just read the book once or twice and notice all the text features (I’ll admit – my old way of reading NF). Mary got me to read, question, seek more info outside the book, feel something about this topic, and contemplate the actions I can take to be supportive of this topic. First Kathleen asked each group to think about a BIG IDEA related to the center work we have done so far, write it on a post-it and put it on the BIG IDEA poster. We wrote: Sanctions don’t necessarily work. Then we all walked around the room and revisited the Drumroll Write-Around images we worked with on Sunday. Our task was to notice if any of the BIG IDEAS related to any of the images. For example, I noticed an image of the Stamp Act and placed our big idea on it. My take-away from this whole class activity was that it helped me to synthesize all the learning I have done so far this week related to Colonial history and now our group is ready to dive into a new SS Center! Kathleen had us do one more whole class activity – Quotes. She asked us to read four quotes said by people in Colonial times, noticing who is saying it and when it was said and if any of the quotes goes with any of the Big Ideas. After a small group discussion around one quote, she asked us to pick another quote and write about how it fits with a big idea. She reminded us that finding quotes is so easy – just google quotes! Finally, Kathleen gave us some questions to ask as we think about planning strong SS Read-Alouds. What writing skills? What notetaking skills? What content targets will be covered? What vocabulary should be in the word bank? What partner materials need to be xeroxed? Mary pointed out that sadly our strongest readers get the least attention and are the most under taught. She shared 5 ways to grow avid and powerful readers in Reading Workshop. Then Mary shared this list of series from the TCRWP website- Series Course of Study – brilliant list!! She showed us a video scene from the beginning of Treasure Planet where we could predict the boy would become the hero. She reminded us that if we really know the literary work, we will get why it is unfolding the way it is. Be ready to reread and see if you missed anything. * what kind of trouble interests this author? * what lessons does this author tend to teach? * is any social history included by the author? For example, Matt Christopher has been writing sports books since 1953. She suggested have kids read his books in publication order and notice how the time period of each book is portrayed. Are athletes and sports’ issues different in books published in different times? * what is the author craft or what makes this book a book by this author? * who is destroyed / honored? * how is hegemonic masculinity and femininity portrayed? * are gender norms reinforced? interrupted? shown alternatively? * who has the power? resistance? * how are sexual identities portrayed? racial identities? cultural identities? She noted that video clips are a great way to introduce critical literacies. His dry humor reminded me of poet, Billy Collins, and he had us laughing many times during his talk! He emphasized that we need to teach kids to be literate in ALL text forms they will encounter in their lives. He made a list, with the help of the audience, of what we CAN’T read including sheet music, the stock page, braille and computer coding. We pointed out that we need to rethink the literacy world. Am I a literacy or literature teacher? They WILL say this if we teach them how all texts works! Mary had us do a bit more Argument Debate work related to yesterday’s Keynote! First she pointed out that even quiet kids participate when you use this structure because the quiet friend only has to talk to one other person! Also, when she has students write long and strong after a debate, the struggling writers are able to write so much more because they had time to orally practice and hear ideas from their partner. And the stronger students start to add counter-arguments to their writing. * Is the effects of a hurricane worse the day after OR months later? * Should ALL be prepared for a tsunami OR just those areas where tsunami’s tend to occur? At our table of four, two of us were Partner A and two were Partner B and two AB partners were formed. She coached us orally by saying: Write down your claim, your reasons, your evidence. You can use Boxes and Bullet notes . Look back into your book for a quote, a statistic, an image. Once we went through the Argument Protocol, she had us write long and strong about our topic. I had SO much to say!! Then we switched gears into NOTETAKING. Since we are getting ready to leave our NF book club book, she asked us to take 15 minutes alone and decide HOW to best make a notebook page to hold onto the information we read and the thinking we did. She emphasized that it is important to have students make notetaking decisions so when they get to HS and college, they can handle taking notes while reading the dense texts they will be assigned. 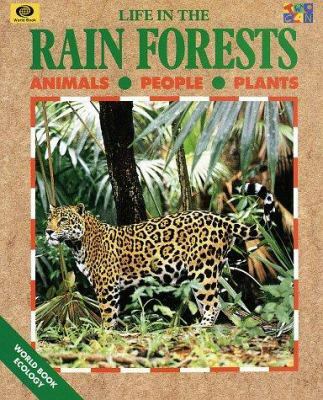 I chose to make 3 columns – one with facts about the rainforest, one with the problems rainforests have now, and one with my written reflection related to my reading. Then Mary had us take a MUSEUM WALK so we could see ALL the different ways notes were taken. Two cool electronic pages of notes were created using POPPLET (http://popplet.com/) and PicCollage (http://pic-collage.com/). Museum walks helps us to see the many ways to organize information! Kathleen also talked about NOTETAKING today. She suggested modeling HOW to take notes during a read-aloud so students can see different ways modeled. She also emphasized that students must gain independence in this skill. We need to model and then let them decide what works best for them. She shared examples of Boxes and Bullets, Bullets and Boxes, Sketching, a chart, a web, and a timeline. To help us get good at this, we played NAME THAT STRUCTURE! She shared a text and we needed to name its organizational structure and why we thought this. Is it cause and effect? How do we know? Is it pro/con, problem/solution, chronological, main idea.details, or compare/ contrast? She suggested and I plan to find examples of text of each structure to add to my ToolKit! If anyone looked in on HM Room 140 at 1:30 today, they would have wondered what was going on?! Alexandra taught us how to read NF text and have partnerships Turn and Act. She read a bit about bats. Then Partner A acted as the bat who eats fruit and Partner B as the one who eats insects and soon arms were flapping and mouths chewing! I am sold. TURN AND ACT is a new directive I plan to use often during a NF minilesson! She is the first person I have heard who uses the SRA kit as a mentor text! She admitted reading the SRA cards in school growing up and to her, they were vignettes, small moment. When she writes now, she is writing one vignette after another, much like those cards from yesteryears! She also recalls being read The Little Match Girl and The Selfish Giant, two books that have inspired her writing today. As groups finish book and prepare to move to another book club book, they can decide what to leave behind with the text set for the next group to have. We decided as a group to add pictures of rainforest plants, video of the Amazon flooding, and Smithsonian articles about the reainforest. it was an inquiry approach; we did NOT know all about our topic so we had to talk it out. THEN we get to change to another center after 3-4 days!! Then Kathleen showed how we can closely read a SS Video. First, she shared a map of the 13 Colonies – what do you notice? Then we watched a Video about the forming of the 13 Colonies for the first time and talked about how the colonies were formed using the map as a reference. Then we watched the same video again, this time taking notes on either the people, the groups, the events or the pros/cons of the land. Afterwards, we shared our notes in our group of four. Then we watched the video a third time, taking notes about a different topic, adding to notes shared by the group member. By watching closely (and having a different lens each time) I actively learned SO much. This is a brilliant way to learn SS content material!! Kathleen said a final task could be to assign a section of the 13 Colonies (New England, Middle, Southern) to a group and they can use all that they know to make a chart to hang in the classroom. Think about WHAT reading levels you have in your class. READ one book from each level and get good at understanding the conceptual work the kids will be doing who read at this level. 2. Ask kids to place their best post-it on their desk. Quickly read and sort these based on skill level being shown through their writing and decide quickly who to confer with using this data. By using the argument protocol in RW, students learn to support ideas with evidence, deepen logical thinking, learn technical language of arguments, are able to defend position with fluency and grace and learn to not argue to win but to find common ground. 1. In a partnership, we gathered evidence for The airport is a good place to live VS The airport is a bad place to live and each had 1 minute to state our claim, reasons, and evidence. 2. We repeated this time thinking about theme – When times are tough, all you need is love OR hope. Again we had 1 minute to state our claim, reasons, and evidence. 3. During the final time, we thought about how the author used craft to develop the setting. She did this best using pictures OR using words.